Spritz the bowl before you go and no one else will ever know! 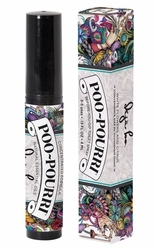 Stop embarrassing odor with Poo~Pourri's Patent Pending bathroom freshener. Natural Essential Oils create a film on the surface of the water, trapping odor at it's source. The 4 mL bottle is a convenient tester size for trying out new scents or getting to know Poo-Pourri.